One binding sewn on! Feeling very accomplished that I have actually finished something. I am going to start the binding on the girl version that I made for our daughter. Sewing the binding on is such a good project for the nights I haven’t felt motivated to hit the machine. The recipient, our son, was absolutely elated with it. I have noticed that the light is changing with the darkness setting that much earlier in the night and not as light in the morning too. Winter is coming and the quilts will be ready for the cooler nights. How happy are these flowers? 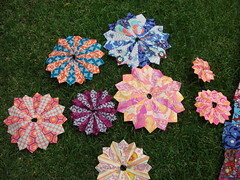 These flowers will sit on top of the quilt in the previous post. Next class I am going to figure out how to put it all together with stems linking the flowers through the garden background. What can I say? I love it. It is the most cheerful project in the world. On the nights I have been too tired to machine sew, I have been slowly sewing on bindings. It is nice to have the balance of a machine project and a hand one too. I had a big backlog of photos developed yesterday and I finally sat down to put them into albums. I came across a photo of a quilt at the Darling Harbour show last year that is of a quilt that is very similar to this one. I am sure the quilt I took photos of also has to have originated from the same shop. 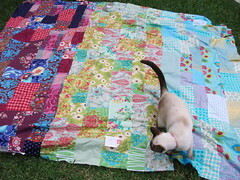 I have been sewing away at the background of this quilt called, Garden Party. The three sections represent the earth, garden and sky and on top there will be numerous flowers spinning around in vivid colors. This quilt has been so easy to work on and I am in love with each and every fabric that was selected. I bought the kit at Material Obsession so cannot make any claim to picking out the eye popping colors. 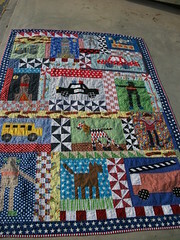 I think you could do a number of variations of this quilt and could use up a bit of stash too. Class is tomorrow and I need to sort out one of my bigger flowers that has gone a big wonky in the middle. Could it be my lack of sewing acuracy……I hope not! Apologies for including a photo of my girl, Coco. She is delicious and I had to share!